Yes, you read the title correctly! 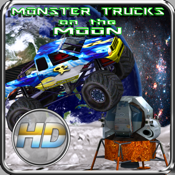 MONSTER TRUCKS on the MOON! Are you tired of crushing the same old Earth-bound objects? Here’s your chance to crush some multi-billion dollar outer space equipment (without that annoying gravity to hold you back)! Zoom, jump, and flip (while defying gravity) across ramps and other obstacles to score points. Heck, our tax dollars paid for it! Fine-tuned and animated suspension physics.